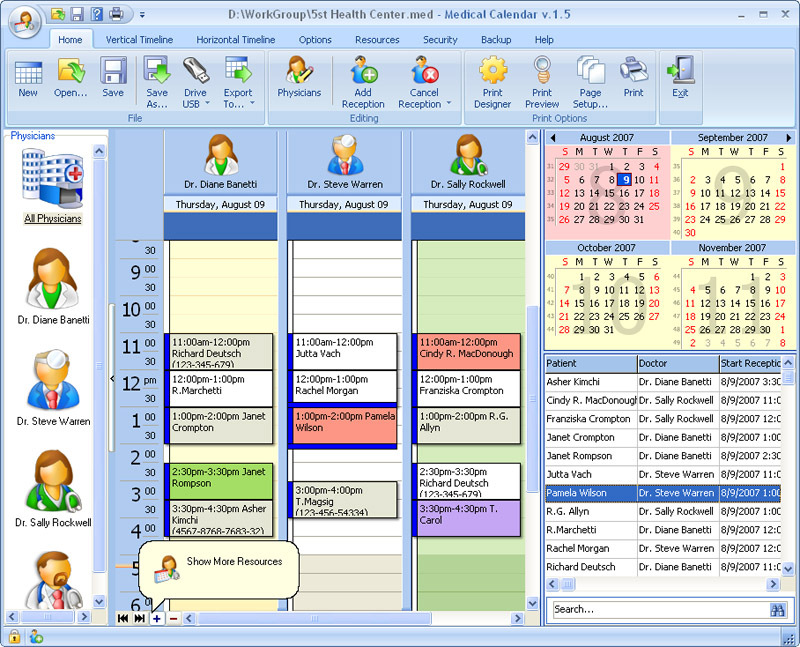 Medical Calendar for Workgroup is a more powerful version of Medical Calendar, with all of the features of the standard version, but with the additional capability to share data in real time over the network. It supports infinite number of profiles and has a well-organized navigation system. The scheduler allows you to password protect information and comes with a rich set of print templates. The ideal alternative to manually tracking patients. ...... Calendar is just what the doctor ordered! Medical Calendar is delivered in a classy interface both intuitive and stylish, making schedule management a piece a cake. Each doctor can create a profile to run his personal schedule. You can instantly switch between profiles to view the schedule of any specialist at any given moment. For your convenience Medical Calendar also allows viewing multiple profiles at a time, to view the schedules of several or even all doctors simultaneously. The creators of Medical Calendar have done a great job in crafting the Date Navigator that makes the scheduler extremely easy-to-use. Qweas is providing links to Medical Calendar for Workgroup 3.4 as a courtesy, and makes no representations regarding Medical Calendar for Workgroup or any other applications or any information related thereto. Any questions, complaints or claims regarding this application Medical Calendar for Workgroup 3.4 must be directed to the appropriate software vendor. You may click the publisher link of Medical Calendar for Workgroup on the top of this page to get more details about the vendor.